Glamorgan seam bowler Will Owen has retired at the age of 26 because of long-term back and hip injuries. Owen, from Prestatyn, played only 24 first-class games, taking 51 wickets at an average of almost 44. He said: "I'm proud to have lived my dream to play cricket for Glamorgan." 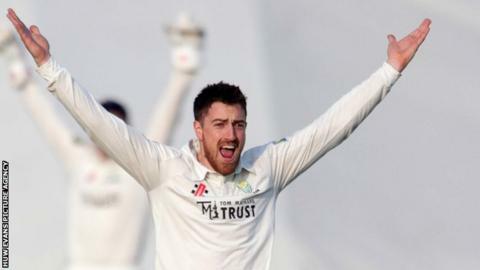 Glamorgan director of cricket and chief executive Hugh Morris said: "It is a great shame Will has retired at an age when a player would expect to have many more years left to play." Owen, who made his first-class debut in 2007, claimed 30 wickets in 2011, but the 2013 and 2014 seasons were interrupted by injuries. He said: "It is with great disappointment that I announce my retirement. "The last couple of seasons have been very difficult as I've tried to get back playing to peak performance. "I am thankful for the support I have received from the club, particularly the medical and conditioning staff."